Toby has become a wonderful addition to our family. As you can see, he’s taken center stage in all family events. Toby is 17 inches tall at the shoulders and weighs 31 / 32 lbs as of today. Wonderful personality, alert, inquisitive, very smart and loving and most importantly, very bright. We love him. My sweet boy, Quinn celebrated his 9th birthday on November 1st. I spent time sitting with and loving my boy while I reflected on all that he gives to me every single day. I've never owned a more intuitive, sensitive, loving dog in my life; these years with Quinn have been incredible. 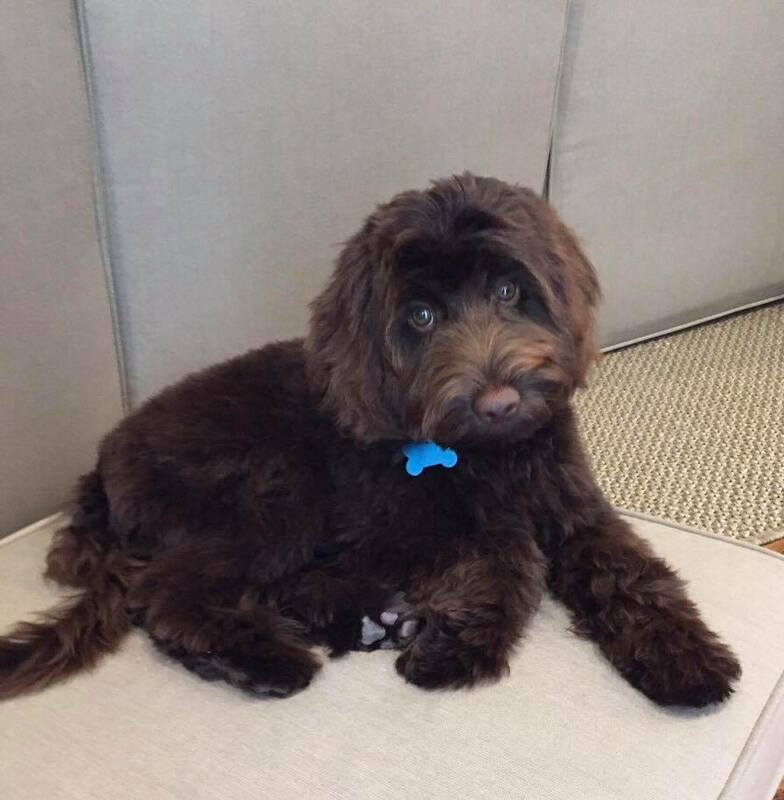 I am grateful to Peggy and Leslie for their ability to breed, raise and match their Australian Labradoodles whose qualities and character are impeccable. Peggy and Leslie have the utmost expertise and integrity. Owning a Seaspray or True Blue labradoodle was and is worth the wait. Thank you for my Quinn. Marshall is 59.5 pounds and 25 inches tall. He is such a sweet boy and loves people. He also likes to steal whatever he can like TV remotes, shoes, socks etc lol When out and about people always stop to pet him and fuss over him. He loves to go on walks ( hunt lizards), car rides ( he won’t jump in the car) and he loves to play catch and play with his toys. Marshall has been a wonderful addition to our family. We love him so much. Thank you Leslie Kalwara and Peggy McElroy. Jamie is a bundle of joy and love❣️ We simply adore her. She is 21.5" tall and weighs 43.5lbs. She loves everyone she meets and, with her teddy bear face, prancing gait and wiggle-waggle hip walk, most everyone who sees her stops to say hello. She is smart, gentle, and loves to snuggle. We have never seen a dog who plays with her toys as much as Jamie. She is also very athletic... loves to leap and run, especially on the beach (she runs like a jackrabbit. Gatsby has exceeded our expectations! After being cuddled and smothered with love on the long trip to Miami Beach we arrived "home". We immediately introduced Gatsby to some favorable "turf", fortunately to his liking and he was very successful at getting busy. Once in his home he made it a point to extensively explore "opportunities" for future investigation. Of course he spoke to us often, telling us he wanted to know what happened to Leslie and the gang. We listened attentively while hugging and kissing Gatsby and let him know that we understood his feelings. However he started to settle after a few hours and actually ate a full meal. We were so pleased. We then when for a "get busy walk" and Gatsby performed like the perfect gentleman that he has been trained to be. As the evening rolled on Gatsby became much more comfortable while at the same time ensuring that he tracked us down when we left his sight. After his end of the day stroll outside,,sometime around eleven o'clock, we placed him in his sleeping quarters (kennel) for bedtime. Well, as you can guess, he let us know his displeasure for a brief period of time and then, after realizing that his protest was not receiving the appropriate response, settled in for a full nights sleep. Gatsby awoke at around 7:00 AM and let us know that he was ready for some personal attention and a "get busy" walk. Again perfectly successful in all respects. Gatsby is a just absolutely the most tender, sensitive, communicative, intelligent and lovable little creature. More than we ever imagined. What a wonderful dream to be a part in. Thank you so much for this treasure. ​I just wanted to take the time to tell you what a wonderful experience I have had adopting Phoenix (from Kelly and Ayden's litter). The communication and information that was given throughout the adoption process was five star. The videos and puppy camera for the first eight weeks was amazing. Then, once you started training him through the puppy head start program the pictures, emails and videos was not only comforting but informative. Phoenix is an awesome addition to our family. He is very well behaved and his temperament is so calm and relaxed loves to cuddle on the sofa with my daughter or play fetch with my son. Leslie, we can't thank you and Peggy enough. Here’s our birthday boy, Ranger (Tele & Beau), who turned 1 year old today! He is 31 lbs of love, curiosity, and energy. He loves boat rides, walks, running, soccer, fetch and meeting new people. We love him! Thank you Peggy McElroy and Leslie Kalwara for giving him such a great start in life! About a Year ago we met a very nice couple at Aventura Mall, who fell in love with Jake. We gave them Peggy’s and Leslie’s number and they played with Jake a little. Last month my husband got a call from Benny, the gentleman we had met, and had fallen in love with Jake telling us they were going to pick up their puppy. Here they are beautiful Lola, sweet as can be and our wonderful boy Jake. Thank you Peggy and Leslie for bringing so much happiness to so many people. I thought you might like to see a little personality from Charlie Brown. He is always entertaining us and making us smile. He loves his toys!! He does a great job of finding the squeaker. He is very handsome and sweet. If he could, he loves to nibble on toes. He loves socks and shoes so we keep them out of reach. He is a fabulous eater and makes that side of pet care very easy. He weighs about 26 pounds. He loves to go out for walks. He loves sticks - the bigger the better. He is very responsive to “Get Busy”, he doesn’t mind going out in the rain. He is so good when we brush him. The Chris Christiansen brush is a dream. We keep his coat long because he looks like a big teddy bear. When he hears the bus come he knows to look for his kids getting home from school. He has his moments where he is a scamp and gets full of it and jumps and runs and looks for trouble. It’s fun to watch him play and pounce and be a puppy. He is doing great at night and is patient in the morning. We have no trouble leaving him for a few hours here and there in his playpen. You really do amazing work with training and breeding puppies. Sometimes we tell Charlie we need to send him back for a little tune up with Leslie - or perhaps we are the ones who need the tune up on our training skills. He is a joy and we love him immensely. He provides so much companionship and comfort. We wanted to say hello and tell you Ryder is doing great! He is a spunky little fella who LOVES people!! He had his second vet visit and was 12 lbs. He got many compliments from everyone at the vet too. He went on his first boat ride this weekend and did great. And he is going on his first sleepover at his grandparents house this weekend. Praying he is a good boy so that he is welcome back there! What fun we are having with him! Thanks for the great head start. It has really helped all of us. Peggy, no words would describe Storm. She’s my best friend, my shadow and my cushion. Lol She knows when I’m or feeling well (I have Fibromyalgia now) and she stays by my side and doesn’t move unless I do. She’s the best dog and companion I’ve ever had or will ever have. 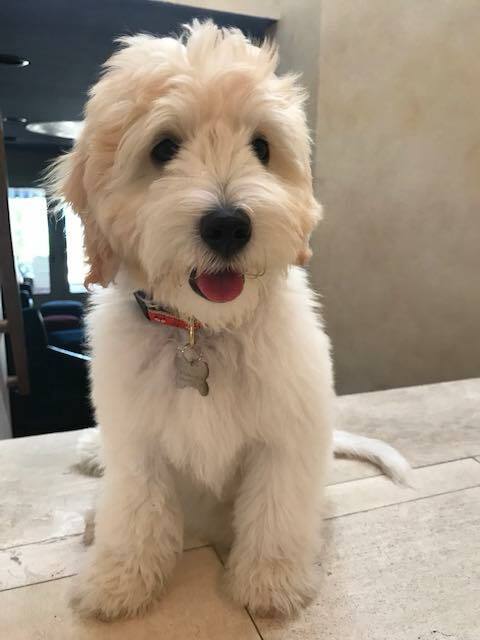 “Maxwell had his first grooming yesterday. He’s not ready for a big boy cut yet, but I’m happy to see his beautiful eyes. The groomer and others were impressed with how calm and well-behaved Maxwell was especially since he is only 4-1/2 months old. They said there’s something special about those Seaspray dogs. They groom Bubbles (Olive & Dover) as well and he has the same temperament. Thanks Leslie & Peggy for these wonderful dogs. I just love Max. He is housebroken and is a joy to be with. He had a play date with Bubbles yesterday, and they roll and play for hours. They both get worn out. Max adapts to his situation. If there’s no one to play with, he’s happy to sit on my lap. Peggy and I thank you for the compliments and making our day brighter! Our lives are filled with so much joy since Chewbacca joined our family in May. What makes Chewy extra special to us is that although we knew he was bred from a therapy line, we didn’t fully understand what that meant nor did we have any expectations of altered behavior. Then he met our son Jake who is autistic. Chewy instantly became a different dog around Jake, he went from active play and “teething” on us all, to immediately calm and just laid himself down by Jake’s side. It was as if he knew he had to use a different approach with Jake. My husband and I were blown away. Chewy will go from high energy to zen-like calm as soon as Jake is near. We’ve witnessed this daily for almost 2 months now and it still amazes us. We can not thank Seaspray, Peggy and Leslie enough for the care and dedication they put into these dogs. We absolutely got the perfect addition to our family! Here’s Bogey. 19.5 inches at shoulder & 39 lbs. Bogey is a water dog. He charges into every stream and pond on our walks, and always finishes with a full swim in our big lake by the house. He has perfected the stealthy, big dive bomb in which he sits nonchalantly on a rock until our old Lab swims buy and Bogey gleefully dive bombs her. Bogey’s afternoon fun is meeting our friends with dogs at the school soccer field. There are several doodles of various sizes, and Bogey seems to always be the leader of a very merry chase and tackle game. Despite all this energy, Bogey is a perfect gent in social situations, and never responds when those other mutts are yapping at him. Needless to say, we love him to bits. He brings much joy and many smiles to our lives." “Here are a few pics of our sweet birthday boy, Arthur. We are constantly stopped by people telling us how gorgeous his color is and how much he looks like a teddy bear! He loves to swim and be chased by his puppy friends. At home you'll find him stealing our socks or pushing his squeaky toys on our legs to throw for him. He is around 17" high and 27'ish pounds (haven't weighed him for a while). The other dog’s owner asked if she could bring her dog over. I asked if her dog was friendly, and she said yes but that she is 14 months old, and quite active. I told her that my dog is the same age and is active as well. We decided to continue our walk without Coda’s toy, but she got a treat right away, and I was more than happy to get her two more balls yesterday afternoon. Good behavior pays, sweet Coda! The other woman told me that I was lucky to get such a well behaved dog. I just nodded my head. I am indeed lucky. I do have a well behaved dog, but most of my luck came from discovering Seaspray online/Leslie and Peggy’s great start. ​“Laney loves wearing my sandals. If her feet aren’t in a pair of our shoes, her nose is! She is a good girl who refrains from chewing them, so we get a kick out of her habit! Laney enjoyed her first lacrosse game! She had a blast playing with the girls, another dog and watching the ball fly past her. She is a dream come true! She is loving, playful, eager to please and quick to learn. Barkley far exceeds our expectations of the perfect dog for us! She is so SWEET, smart, fun, and our perfect companion! She is 30 pounds and 18" at the shoulder. Her idea of a fun day is to walk, saying hello to all of our neighborhood deer and dogs, follow me and go everywhere together, play fetch, talk to our back yard squirrels, go for a swim, lay by the pool, ring potty bells and then make it clear it's time for another walk, play with toys, and wait for that much-loved Dad to come home from work so she can do some very serious playing! We just cannot thank you enough for our dream puppy, Leslie and Peggy. Barkley was bred to perfection and given such a super start that we just had no issues! Priceless! Thank you for giving us the opportunity to love and have this little girl. It’s so hard to believe that she’s only been with us for a short time. Lexi was such an immediate part of our family! Lexi has taken over the house with ease. She’s such a smart little girl! When we take her out people stop and ask about her. We get so many compliments on Lexi’s manners and and sweet disposition. She never leaves my side when I’m home. I’m her person but she loves us all. My husband is just completely in love with her! He was afraid of getting a puppy for several reasons but she’s completely won him over. The good thing is my granddaughter is here for spring break so one of us is always with her. Lexi has a collection of toys in her kennel. That is her place and she collects all her things places them in her place. If we move her things out of the kennel so that she has room to stretch out ....She promptly collects them and returns them to her kennel. It’s one of the really big 36 inch kennels so she even has the big stuffed animal that you sent home with her in there. It’s really so funny! We are so amazed at how protective she is of us. Lexi from day one knew who her family was. My granddaughter (Kaitlyn) and I took her out with us Wednesday. Kaitlyn sat in the car with Lexi while I went in to the doctors office. A lady approached the car and brushed up against it. The doors were locked but Lexi alerted my granddaughter immediately. She acted like she was a huge dog that would eat somebody up! Kaitlyn found it so funny because at that moment Lexi could have just as well been a huge German Shepard! She knew nobody belonged near that car where my granddaughter was. Integrity, passion, energy, intellect…these are just a few of the words Leigh and I used tonight as we talked about you (Leslie) and Peggy and the joy you bring to the lives of so many souls. I say “souls” because you bring happiness to both the humans you touch as well as all those “pup-pup-puppies!" I know I’m not alone in my observations. I guarantee everyone in the audience today thinks the same thing. You and Peggy are inspirational. While you've applied your talents to breeding Australian Labradoodles, you could just as easily have excelled at anything else. We, however, are glad you chose to do the doggie thing!!! Whenever we think of you we have nothing but admiration for you as both business professionals and wonderful people. Again, thank you for letting us into your world. We never want to leave. Cooper just had his last set of vaccinations for the year. A whopping 35.2 pounds! Good grief! We should have named him Goliath. The vet said he is one of 2 dogs that is just so memorable. They are so impressed with his temperament, gentle nature and cooperativeness. Well, except for the rectal temp taking . Even though he will be going in for monthly weights until he reaches 50 lbs. for his heart worm and flee and tick meds the vet asked if we could just drop in periodically so they can visit with him. What a compliment to not only Megan and Rugger, but to Peggy and Leslie also. Feeling like a proud mama! ​One year ago today our lives changed forever... this sweet little peanut became a part of our family. I gained a best friend that I wasn’t expecting. A companion that has been such a blessing; a reminder to slow down, to cherish all of the moments. She’s brought out a compassionate side of my son that we hadn’t really seen before and the silliest giggles and most amazing joy in our daughter. The bond she has with my husband is nothing short of adorable. The way she jumps on his chest each night for her pets and licks him like crazy just melts my heart. Penny— you are incredible. And although you’re looking a little cray cray  from that haircut that’s finally beginning to grow our, we love you with all our hearts  I honestly wasn’t the most on board about getting a puppy because I knew the additional responsibility would fall to me, but now I realize how silly those thoughts were. I couldn’t imagine my life without her and it’s hard to remember what life was like before her... little stinker... lol​. ​We adore our girl - she’s been the perfect addition to our family. She is a wonderful lure to keep our two college-age children coming home for visits to “see the dog”! ​Our Bailey girl is adapting so well!! She is on an awesome routine. She has slept through every night. She used to whine when I left a room, she no longer does. We are gradually giving her more room to roam. She couldn’t be any better than she is. She does have her puppy moments, but overall.... we hit the doggie lottery! You guys sure know how to breed, train, and raise cream of the crop!!! Xoxo Thank you! ​I feel so blessed that I came across your website page when seeking a breeder. My pup has been such a blessing to me and my family. Thank you for the many times you've taken my calls and have been there for us. Waiting for my pup to arrive! ​I am waiting on my pup, so I am commenting on the process which has meant so much and is so impressive for many reasons. I can have daily information and updates from all the members on FB site, a really caring and helpful addition to help prepare forthe arrival of my puppy. The puppy cams just adds to the excitement and is a learning experience every single day. I cannot day enough good things about how Peggy and Leslie allow me to become part of the process and learning experience during the wait. Nothing could have prepared me any better than this experience with fine caring people that I can tell love their dogs and love their jobs. It doesn’t get any better that this. ​I am the proud Guardian of two Seaspray breeding females: Lexie (now retired) was born Dec 11, 2011 to Truffles and Apolo; and Lana, born Oct 19, 2017 to Bailey and Dover. Both Lexie (6 yrs old) and Lana (12 weeks old and a future breeding female for Seaspray) are part of the therapy line through Truffles (Lexie’s mother and Lana’s grandmother). Lexie is biologically Lana’s aunt since Lana’s mother, Bailey, and Lexie are litter mates. In the late 1980s I had a miniature Poodle and a yellow Labrador (both female and both fixed). I loved them both very much but often thought that the “perfect dog” would be one with the non-shedding hair of my Poodle and the sweet and calm demeanor of my Lab. It took me twenty years to learn that just as I was thinking those thoughts a man in Australia, named Wally Conron, who was the breeding manager for the Royal Guide Dog Services in Australia, was breeding just exactly that “perfect dog”. In 2010 I retired from my second career (Aircraft Dispatcher for a Delta Connection Carrier -Atlantic Southeast Airline) to move myself to Florida from the Atlanta Area and to move my ailing 89 year old father from North San Diego County, in order for us to share a home and for me to care for him. I started researching Labradoodles in about 2009 and continued that research while setting Dad and me up here in our Florida Forever home. During my research I came to the conclusion that a multi-generation Australian Labradoodle was the right dog for me. Then my task was to find the right place to get one. I first hoped to be able to find one through a rescue organization. There are many wonderful such organizations but finding the right dog in an accessible location proved a problem for me. I also decided that I really wanted to get a puppy who I could introduce to my rescue cats (I had three at the time) at an early age. All of this led me to research ALD breeders, especially those near me. Of all the breeders I searched and studied Seaspray Australian Labradoodles was, for me, the most impressive. They also had the added advantage of being only an hour and a half away from me. Dad’s health rallied for a while after we moved into our lovely Florida house. But I was in no rush to add the responsibilities of a brand new puppy to my already busy duties, caring for Dad. But I continued monitoring Seaspray’s website and was delighted to attend my first Doodle Day (and then many more) at Peggy McElroy’s home. I had spoken to Peggy by phone first and was impressed. I was even more impressed once I met her in person on my first Doodle Day. I was also very impressed with her business partner, Leslie Kalwara, owner of True Blue Australian Labradoodles. By the summer of 2011 I was on the Seaspray waiting list. Leslie Kalwara’s skills as THE Puppy Whisperer were absolutely clear to me by the fall of 2011 and so there was no doubt that I wanted my puppy to go through her 3 week Puppy Head Start Training, even it delayed my bringing Lexie home. Dad’s health was failing markedly by Nov/Dec 2011 and Hospice care was invaluable to us. We celebrated Dad’s 91st birthday on January 28, 2012 but he was ready to join my mother and his parents and brothers and sister in what lies beyond this realm. With permission and love from my brother, Jeff, and me and wonderful care from Hospice and the caregiver from Right At Home, we made Dad comfortable and happy and on February 2, 2012 he departed this life for his next adventure. His passing was peaceful and he knew how much he was loved here and that we would be okay without him. My brother and I were sad at Dad’s passing but not heartbroken. Dad had lived a long, eventful and valuable life and was moving on to reunite with his wife and loved ones. I keep planning to tell you how terrific Maggie is. I cannot believe she is 4. She is the perfect dog for this stage of our life and probably the best one we have ever had. We keep having friends say they will take her in a minute. Our vet said she is in the top 1% of healthy dogs. Our friend runs with her a few times a week. She loves it! Our home is open door to guests etc. and she loves it. She has great manners. We are no longer motor home travelers. She adjusted to our changing schedule all the time. We cannot thank you enough for the joy she has brought to us, family and friends. Oops! Forgot she also won a blue ribbon in our community for her size, 20 lbs. Thanks again for this member of our family. Our puppy, Beau and our journey with Sea Spray Labradoodles has been a storybook experience. After meeting their dogs, we knew we wanted to welcome one of their puppies into our home, but we had no idea how perfect our puppy was going to be. 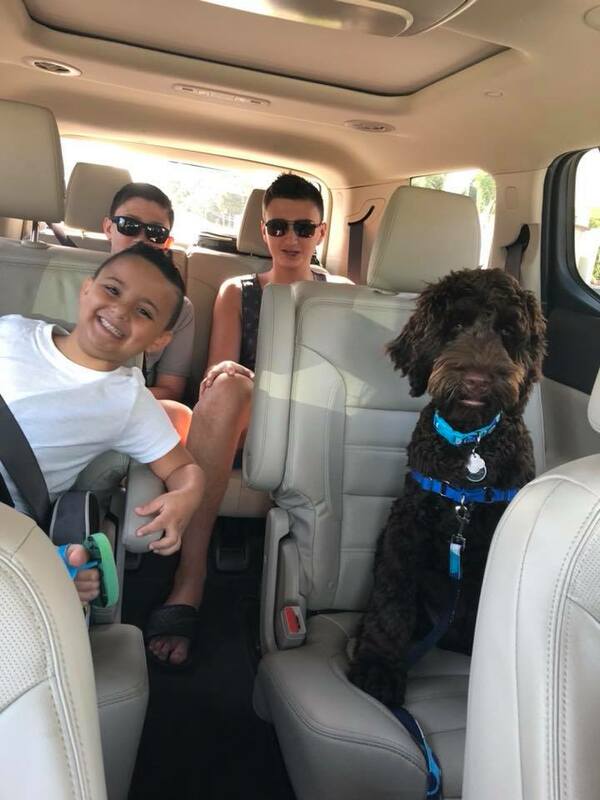 If you are considering a puppy and are fortunate enough to have located Seaspray Labradoodles you need not look any further! The care the puppies receive during their first few weeks is exceptional. Our puppy was able to adjust to his new home environment with ease. He arrived well socialized, playful yet calm, with minimal house training accidents (he was practically house-broken from day 1) and is wonderful with children. Seaspray did an outstanding job of matching our family to the ”perfect” puppy. We couldn’t be more delighted with Beau! We are SO HAPPY with our Seaspray Australian Labradoodle puppy. Tess has the best and sweetest temperament of any dog we have ever seen. Peggy & Leslie's description of Tess as she grew up was dead on ! Words can not describe the happiness that Tess has brought to our family. My 8 year daughter says " Tess is the little sister I always wanted". Their "puppy training" program at Leslie's house is a no brainer. I would highly advise all to take advantage of this service at Leslie's loving home. Tess was LIGHT years ahead of every other dog, even a few 4 months older at the training classes in my home town. That early training really made this new adventure a great success. We can not thank Peggy and Leslie enough for this sweet new family member. What a JOY ! Those of you thinking of buying a happy, healthy, lifelong friend, look no further! 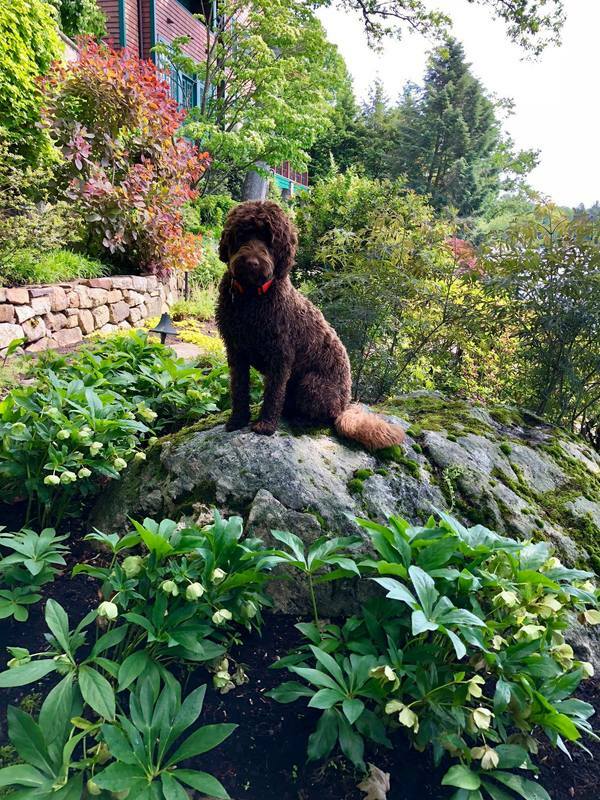 I researched Australian Labradoodle breeders for several months, I found that there are a wide variety of breeders, some are good, some are poor, and then one stood out to me as excellent, and that was Peggy and Leslie at Seaspray Australian Labradoodles. I talked to them many times on the phone, all my questions where answered, and never, ever, did I feel rushed or pressured. My husband and I actually got on a airplane to visit Seaspray. After meeting Peggy, Leslie, and all her beautiful Labradoodles in person we were positive we had found the breeder for us. It has been a little over 6 weeks since we picked Bella up and I find the words hard to find. To say we are pleased does not come close to how we feel. I had to take a medical disability 14 years ago and after being off work for a year I felt I needed a dog so we bought a Labrador Retriever and she made a fine friend for me and our family. We lost Maggie last fall and said we would not get another dog and have to go through the loss again. After a couple of weeks I read an article in the local newspaper about a retired man who had a Labradoodle he took to Vanderbilt Children’s Hospital to visit with the sick children. Well I started reading about Labradoodles and then Australian Labradoodles. My wife was not on board with a new dog and really not on board with a dog that would be living indoors. 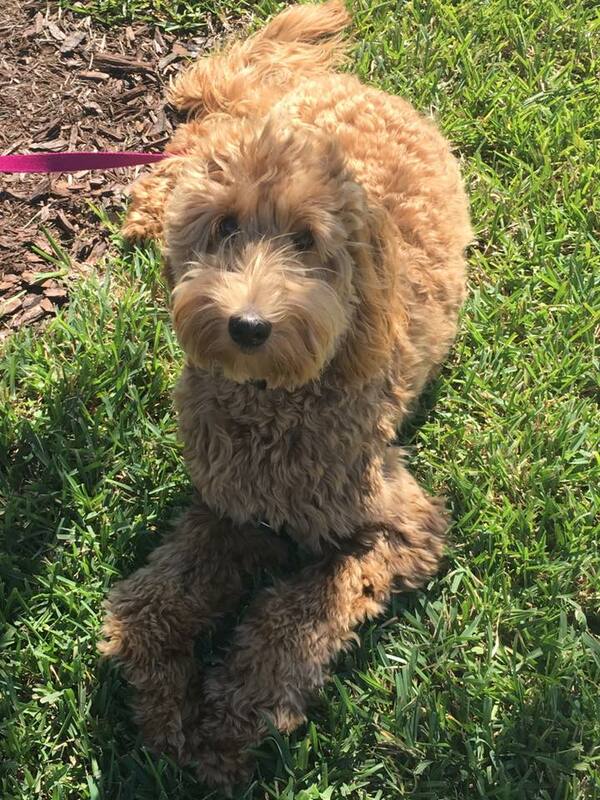 I continued to research the breed and breeders and found your listing on the Australian Labradoodle Association of America and took the link to your web site. That is where the education really began. I sent an email to you and also to several other breeders. I received an email response from Peggy & Leslie and before I finished emailing the other breeders. They answered questions I had and made me feel at ease with doing business with Seaspray. Even though we had never met all of my questions and concerns were answered over the 11 weeks we waited for Bella. It was a long time and then again time flew. I received weekly photo’s of the puppies along with weekly weigh in results and many videos. Prior to the allocation of the puppies I received a telephone call from them and we went over our lifestyle and what we were looking for in a dog. Then came telephone call informing us of our puppy to be followed with the posting of photos and the parents names. The photo’s continued to be posted up to the puppy age of 8 weeks when they started going home. We elected to have Bella go through Puppy Head Start. The 3 weeks that Bella was going through the training I would get at least 1 video and most days it was 2 of her going through her daily training. The week prior to picking Bella up we received a written list of what took place everyday with Bella. This was a detailed list by time and training that takes place. We also received a list on all the commands Bella knows and what we need to do to continue her training. We even received a video of Leslie and Bella going through her commands. My husband announced one morning that we needed a dog. He did not care what type of dog as long as it was a BIG dog. So began the hours of research looking for that perfect fit for our family. I researched information and categorized different breeds always returning to the Labradoodle. Now I just needed to find the right size for our family and the right breeder. One morning, by chance, we met a friendly bulldog and her owner. During our conversation she mentioned Peggy and her Australian Labradoodles. I was in beach mode with kids and filed the information in the back of my mind. Life moved on, I continued to interview Labradoodle Breeders and to educate myself on the difference between Labradoodles and Australian Labradoodles. I experienced an array of environments and some were not so pretty. Then I remembered the conversation I had with the bulldog and her family. Could our future dog be a Seaspray Australian Labradoodle? Why didn't I investigate Seaspray earlier in my hunt? I do not have the answers except to say that I am very happy I did do my research. There is no comparison, when I met Peggy and Leslie everything fell into place. My search was simply over when I saw the love, patience, compassion and heart they had for each and every puppy. It is hard to put into words the way the puppies respond to them and the way they cared for each one individually as if they were the only puppy in the litter. Not to mention the rules both Peggy & Leslie have in place for meeting the dogs which involve things like disinfecting shoes and additional hand washing. All pluses in my book. After meeting Peggy and her doodles, my confirmation was complete and my heart was forever hooked. Our sweet Dublin came into the world in August. He is absolutely the best and most amazingly loving dog any family could ever have. I am stopped constantly and asked what breed he is and people want more information. They can't believe his demeanor especially for a puppy. 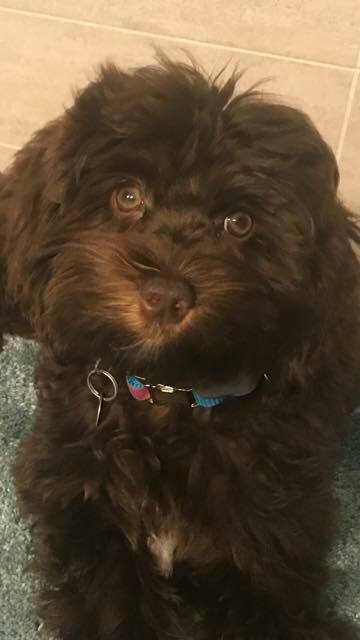 I am constantly told he looks like a stuffed animal. I walk him in our neighborhood and cars drive by smiling and pointing. He is a people magnet, simply a Rockstar. Within one week of sending out our Christmas cards I had three phone calls from friends wanting to know all about Dublin. They will now be attending future Doodle Days. We love him so much and for so many reasons to include his sneaky habit of acorns and mulch, we are working on correcting that. He is a very sweet, calm, gentle and loving puppy. He is also a cuddler yet loves to play, play, play and learn new things too. As for my husband's opinion, Dublin is perfect in every way...our family feels complete!